My cousin emptied the dirt from the two small wooden boxes and assessed the damage. “OK, it looks like you used a bit too much water”. Nawsheen wiped the sides of the boxes with a tissue.“I thought I wasn’t giving them enough water and too much sun”. “No. When the succulents start turning black that means they’ve been overwatered”. The succulent trapped in the terrarium had turned black. It almost made the year. However, after a move to a more sundrenched window sill, I may have disturbed the balance of the inner terrarium world and each leaf of the succulent blackened then collapsed into the dirt. I had bought two more succulents housed in the wooden boxes that Nawsheen was inspecting. After leaving them in the car under intense sunlight whilst I picnicked, they slowly withered away – leaves flopping down, emphasising my neglect. “Your sister told me she managed to kill her cacti”.“I’ve killed cacti”, I thought. My sister and I had two things in common - we couldn’t care for cacti and we shared the same parents. The Karim’s did not have green thumbs. Nawsheen on the other hand lived amongst thriving life. Earlier we had wandered through her backyard as she clipped the ends of her garden succulents. We passed a shelf showcasing her wares for sale – potted plants, terrariums, her painted works from pottery class. Nawsheen’s three-year-old daughter showed me her fairy garden – a large pot with luscious green plants obscuring tiny houses, gnomes and mushrooms. Two wombat-sized dogs repeatedly met our ankles. I looked at the idyllic yard. “This must take a lot of upkeep”, thought the yardless apartment guy who avoids sunlight and neighbours. Nawsheen laid my items on a table in her garage – the empty boxes, glass jars and the succulents. She instructed me to spoon some pebbles and dirt as layers in each of my vessels. 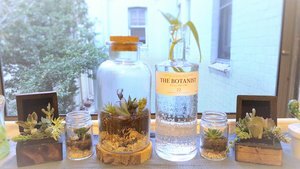 I had two small glass jars which used to hold probiotics and an empty bottle of “The Botanist” gin donated by my flatmate. Nawsheen cut up a couple of Ziploc sandwich bags into squares to line the wooden boxes. “I’m going to give you two because I know you like to water your succulents”. “Yeah I get it – I killed them with water. I feel like I’m the dumb guy from another planet that just encountered a plant and you’re schooling me. Derr… How much water? Is this too much sunlight? Do I rotate you now? How do you breathe inside that jar?”. How much science and how much art was involved in Nawsheen’s pursuit? Consider baking. I treat baking to be more of a science. I am particular about using the correct weights and volumes of ingredients, setting the right temperatures and using the suggested times. The presentation is more art. Though with repetition and adherence to the recipe, my baked treats looked closer to the recipe’s image. The succulents in the wooden boxes came with care instructions: “20 ml/wk. Let soil dry out in between”. Nawsheen even provided a syringe to measure out the 20 mls. So very science. Yet I promptly disregarded the instructions and poured a generous amount of water over the plants and left them on the window sill. I simply hoped that life would find a way, like in that movie about Jeff Goldblum and the dinosaurs. “When you’re arranging, I think ‘thriller’, ‘filler’ and ‘spiller”, said Nawsheen. I knew what each word meant but together it sounded like a Michael Jackson music video parody. “‘Thriller’ is height. You want to be mindful of the tall succulents that will tower over the shorter ones, and whether you want them at the back. ‘Filler’ are those that fill the spaces in the middle. It’s like texture. They’re for structure and are medium in height. ‘Spillers’ are the ones that will spill over the edge of the container. They soften edges”. Arranging succulents was more art than science. “I also think odd numbers. So arrange in threes or fives”. I nodded my head in agreement but had no idea what she was talking about. “If I do fives, can I just put a succulent in each corner and one smack bang in the middle?”. “Sure!”, she said curtly. My little cousin has a great way of intonating that she agrees whilst rolling her eyes without visibly rolling her eyes at you. Encouragement and disapproval with a hint of “you’ll figure it out”. We each arranged our succulents per box. I looked at her arrangement. “Wow, yours is so profesh”. “Yours is good too”, she said. “I would put this tall one at the back. See it’s bent? Let it fall forward naturally”. She made the rearrangement. “There”. I worked on the terrarium placing three succulents along the sides and a two-leafed plant called a “Wandering Jew” in the middle. I’m certain the plant-naming people were having a bad day on that one. I used a foundation brush to clean the dirt off the inside along the edges then placed the cork on top. “I have an idea for the gin bottle. Let me just wash out the gin first”. Nawsheen returned with two leaves on a stem wedged in the neck of the bottle. “This is ‘Devil’s Ivy’. When you get home, fill the water up to the neck. You’ll see the roots grow out into the water. Like this one”. She showed me a clear rounded vase filled with roots and leaves spilling on top. “This was from one cutting like yours”. Seeing the “after” plant pleased me. Knowing that my little Devil’s Ivy could sprawl into leaves and roots pleased me. The whole tiny world of the succulents was pleasant. I looked into my terrarium and imagined a miniature version of myself walking around, not panicking that I had no air due to a giant ceiling-cork. I recalled my visit to Canberra’s treasure - Cockington Green Gardens. The miniature buildings and gardens were so quaint and I purposely slowed my walk to feel like a lumbering giant (whilst roaring quietly under my breath). I thanked my cousin for teaching me the ways of succulents and said goodbye. I placed the succulents in a green canvas shopping bag. As I drove from Nawsheen’s house through the streets of Camden, I entered a roundabout and heard the clanking of glass behind me. I pulled over and checked the bag. The terrarium and gin bottle had toppled over. I placed them upright and secured them into a firmer position to handle the remaining fifty roundabouts upon exiting the suburb. Five minutes - the plants didn’t even make it five minutes from my cousin’s house. Once home I checked the terrarium. Dirt had kicked-up along the sides. I popped the cork off, replanted the plants and cleaned the sides with a brush. I checked the gin bottle. A leaf of the Devil’s Ivy had snapped off. I filled the bottle with water to the neck and wedged the stray leaf in. The stem just reached the water level. “It’ll be fine”, I thought. Life will find a way. Just like Jeff Goldblum.